Disability is a complex multidimensional social construct where the type of disability and the level of support of individuals needs to be considered within leisure provision. In a leisure context, people with a disability often face a multitude of constraints to participation. However, when leisure is possible, the benefits are substantial and worth pursuing. While other marginalised populations have received a great deal of attention across disciplines and in the field of leisure and recreation, disability has received comparatively less attention and generally in isolation to the leisure context. 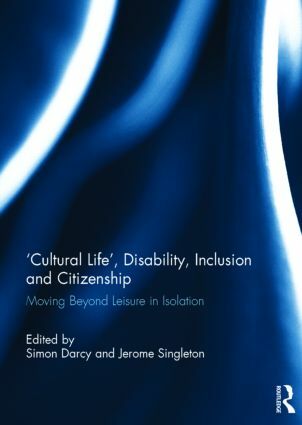 This book concentrates on "disability citizenship in leisure". The chapters focus on examining the leisure lives of people with different types of disability by supporting their leisure endeavours through innovations in technology, service provision and the imagination. Each chapter has a different social setting, involves different groups of people with disability, and challenges conventional wisdom about what is possible when ability is seen, nurtured and, then, flourishing with the opportunities provided. Rather than leisure being seen in isolation, the context of this book explores leisure as part of everyday lives of people with disabilities whether that be part of promoting inclusive practices across University basis, invoking an innovative technology of Photovoice to allow people with intellectual disability to provide insight into their hopes and dreams of community living, maintaining mental health in refugees through innovative leadership programs or how people with traumatic brain injury can regain autonomy through the arts. We situate the book in the context of further challenging researchers to think beyond disability as a context in their research and engagement of the person as a citizen in leisure opportunities, as opposed to a disability. This book was published as a special issue of Annals of Leisure Research. "This anthology consists of five chapters that were previously published in a special issue of the journal Annals of Leisure Research . The editors Jerome Singleton and Simon Darcy notes that previous research on leisure and people with disabilities, most have focused on people with disabilities. The book explains how the university can be made ? ?more inclusive, which benefits migrants with mental health problems have a leadership program, how people with intellectual disabilities see in society and the importance of drawing, theater and dance can have for people who received a traumatic brain injury." Simon Darcy is a Professor of Diversity Management at the Business School, University of Technology Sydney. He is an interdisciplinary researcher with expertise in developing inclusive organisational approaches for diversity groups. Simon's work is characterised by implementing the outcomes of his research to change business, government and the not-for-profit sectors practice. Jerome Singleton is a Professor of Leisure Studies; he is also cross-appointed with Faculty of Management, Nursing, Sociology and Social Anthropology at Dalhousie University. Jerry has published articles in a variety of publications such as Australian Journal of Occupational Science, Activities Adaptation and Aging, World Leisure Journal and Loisir/Leisure. Dr. Singleton’s research is based upon the intersection between Leisure and Aging and how they are interrelated to enhance a person’s access to Leisure across the life course.